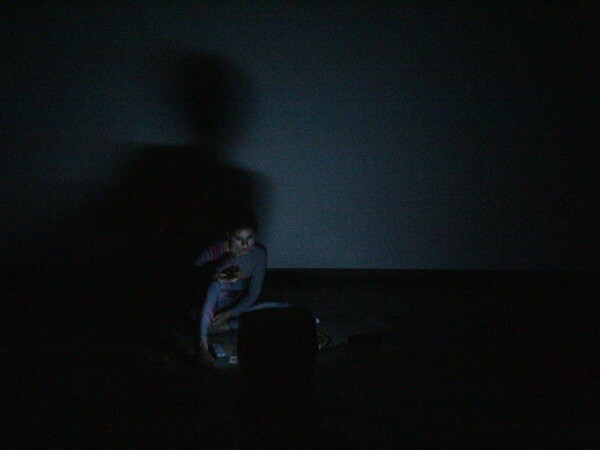 This collaboration with Mumbai-based actor Jyoti Dogra is an adaptation of Franz Kafka's parable Up in the Gallery. We approach the text from two different perspectives. We explore the subjective positions of the spectator and the performer, the observer and the observed. This time, the Frail Tubercular Lady Circus Rider doesn't even bother about executing her circus numbers anymore. Instead, she utilizes several cameras on stage and in the projection, we only see live images that resemble her performance. The cameras initiate the viewer and the performer into a world that constantly shifts and plays with reality, dream and illusion, exploring the interdependence between technology and perception. K⁰ Act 1 was conceived by Jyoti Dogra and is not featured on this website.